March may have breezed in like a lamb, but it is roaring out with the ferocity of a lion. A lion that has stalked and devoured more than its fair share of the good things of this world. March is a calendar page I’d just as soon see flipped over. Six years ago, it snatched up my best friend, Nyk. This year it beamed away the fabulous Mr. Spock: gifted actor, director, photographer and writer, Leonard Nimoy. 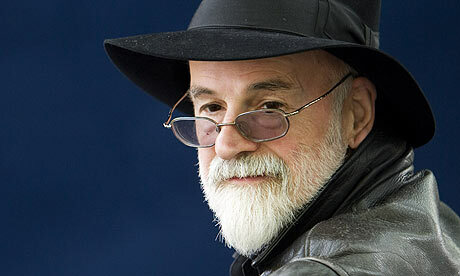 On Thursday, March 12th, it snuffed the blazing candle that was one of my favorite authors, the amazing and astounding Terry Pratchett, although no one and no thing could fully extinguish his spark. To you, Sir Terry, I raise a toast to your worlds and your words. The disease that took you can’t take away the gifts you’ve given to me and so many others. Thank you for Binky and Greebo, Susan and the Death of Rats. For Samuel Vines, Tiffany Aching and the Wee Free Men. For Mort, Cut-Me-Own-Throat Dibbler, Nanny Ogg and Granny Weatherwax. Most especially for Granny Weatherwax. For the innate and powerful wisdom of Headology. Thank you for your beautifully realized, but hysterically polarized Discworld; a more bizarre, yet somehow still warmer and gentler version of the warped reflection of the society that we view, skewered in the mirrored screens of our TVs and laptops and cellphones. Thank you for sharing your light. Your grace. Your magic. Thank you, Sir Terry, for filling my glass. This entry was posted in writing and tagged sir terry pratchett. Bookmark the permalink. What a lovely personal tribute. He will be missed. Thank you, Anne. It is such a great loss.